This talk will discuss issues in the design, construction and analysis of “self-replicating robots,” i.e., robots that can make copies of themselves from spare parts. Videos of toy robots that can replicate will be shown. In order to quantify the robustness of such robots, measures of the degree of environmental uncertainty that they can handle must be computed. The entropy of the set of all possible arrangements (or configurations) of spare parts in the environment is such a measure. Moreover, the rate of reduction in configurational entropy during replication can be used to assess bottlenecks in the replication process. Issues in how to design parts to facilitate the reduction in entropy are therefore addressed. 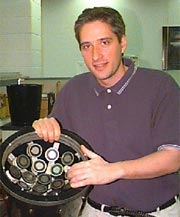 GREGORY S. CHIRIKJIAN received undergraduate degrees from Johns Hopkins University and his Ph.D. from the California Institute of Technology. Since 1992 he has been on the faculty of the Department of Mechanical Engineering,Johns Hopkins University, where he is now Professor. He served as department chair from 2004-2007. His research interests include robotics, applications of group theory in a variety of engineering disciplines and the mechanics of biological macromolecules. He was a National Science Foundation Young Investigator in 1993, a Presidential Faculty Fellow in 1994, and a 1996 recipient of the ASME Pi Tau Sigma Gold Medal. He is a Fellow of the ASME and the IEEE. He is an author of 200 publications, including three books. President Robin Taylor called the 2,293rd meeting to order at 8:22 pm December 16, 2011 in the Powell Auditorium of the Cosmos Club. Ms. Taylor announced the order of business and introduced three new members of the Society, including the speaker of the evening. The minutes of the 2,292nd meeting were read and approved. Ms. Taylor then introduced the speaker, Mr. Gregory Chirikjian of Johns Hopkins University. Mr. Chirikjian spoke on "Entropy and Self-Replicating Robots." Mr. Chirikjian began by discussing and differentiating the concepts of replication, self-replication, and self-assembly. He introduced the history of self-replicating automata, discussing von Neumann's theoretical model, Penrose and Jacobson's simple blocks, NASA's interests for space exploration and development, and homogeneous and heterogeneous modular robots. He then explained that there are different degrees of self-replication and that a given system's degree can be quantified in multiple ways. Mr. Chirikjian demonstrated early prototypes that utilize both structured and unstructured environments to replicate a robot using passive mechanics, as well as a prototype that self-replicates using random motions. He compared and contrasted these examples, describing the complexity level of the components, the final robot, and the tasks required for replication. A potentially useful measure of the degree of self-replication involves the ratio of minimum and maximum part complexity divided by the average part complexity, he said. Mr. Chirikjian continued by discussing how a change in discrete entropy could also be used to describe the degree of self-replication. This measure is a hybrid of statistical mechanical and information entropy involving the poses of the parts within the environment, he said. He described how a prototype with discrete tolerances for uncertainty in its part positions can be classified using this measure of self-replication. Mr. Chirikjian then explained how robots could self-diagnose part-wise problems using probabilistic group judgments of specific self movements designed to highlight failure states. These judgments and the resulting diagnosis are communicated between robots, potentially leading to self-repair or other assistance from the group. This research is continuing via more complex prototypes and larger numbers of subsystems, with potential applications to integrated naval structural repair and space exploration using automated factories, he said. Mr. Chirikjian concluded by discussing a recent prototype made of custom molded, modular plastic parts with passive embedded wiring. Though the parts are fairly simple, the resulting robot is quite complex and consists of a moving gantry that is able to utilize a cache of available parts to replicate its own track, towers, and gantry structure. He also described how printing parts containing conductive patterns could be used to create castable motors, which would enable the future creation of a fully functional cyclic fabrication system. After the question and answer period, Ms. Taylor thanked the speaker, made the usual housekeeping announcements, and invited guests to apply for membership. The 2011 Annual Meeting of the Society was held. At 10:01 pm, President John Ingersoll adjourned the 2,293rd meeting to the social hour.